Dyson's Hot+Cold Floor Fan is suitable for medium & large rooms and can heat a room fast in winter and powerfully cool you in summer. The Jet Focus control technology in this heater & cooler allows you to swap between focused mode, for long-range powerful airflow, and wide projection to mix surrounding air. 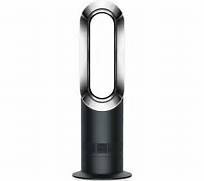 Air Multiplier technology, which accelerates the air through an annular aperture for high-velocity airflow, allows Dyson fans to operate completely bladeless: safe, efficient, quiet and très chic. This machine features a tip-over cut-out that initiates the auto shutoff if the heater is tilted or knocked over.